Tech/Gadgets Archives - My Life, Blogged. Whether you’re trying to entertain a toddler on a crowded plane, encourage your child’s newfound love of reading or simply find a movie for the whole family to enjoy, finding the right content should be just a tap or two away. Parents want the best for their kids, but when it comes to digital entertainment, it can be difficult to know what to look for. Starting today, we’re making it easier to find great family-friendly content on Google Play. Parents can now find family destinations across the Play store, with new features for browsing by age and interests. We’re also providing more useful information about apps and content on Google Play and improved tools so you can decide what’s right for your family. On the Apps, Games and Movies & TV homepages, you can now tap the Family button to browse our new family-friendly experiences. On the Books homepage, tap the Children’s Books button. Since toddlers and tweens have different interests and abilities, these pages let you browse by age range to find content that’s the best fit for your family. Whether your child is still learning shapes and colors, or is getting into more scrapes than Judy Moody, you’ll find inspiring ideas for every age. What’s more — top charts, recommendations, and even searches from family homepages are filtered to our family-friendly catalog. For many of us, childhood memories include at least one favorite character: a plucky personality from a book, the superhero from a movie or a beloved stuffed animal. Characters are just as relevant today, and Lego, Barbie and other kids and family brands are some of the most popular searches on Google Play. To help you browse Google Play content around a favorite character, we’ve created special pages featuring dozens of top characters from across the globe, like PBS KIDS, Pororo and Peppa Pig. 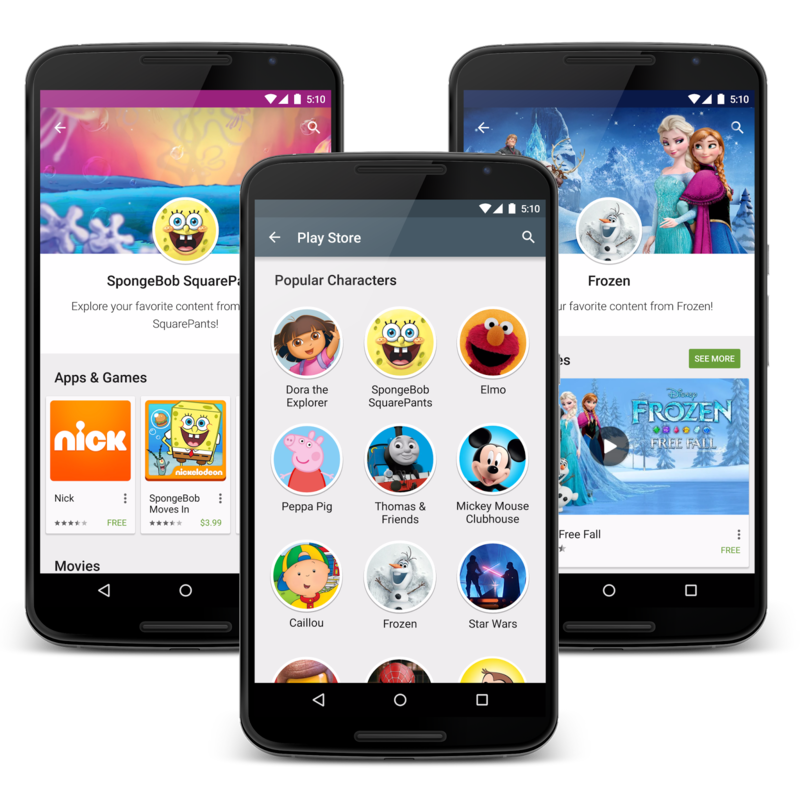 From the Play store app, take a tour through all of our popular characters to find apps, movies, books and more from your family’s favorites. 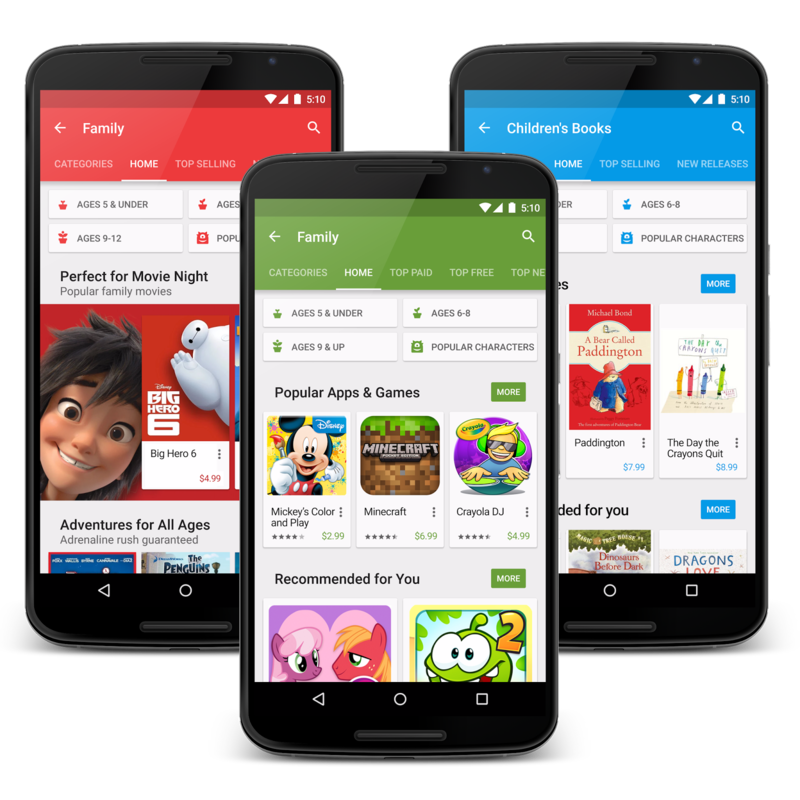 When it comes to finding content on Google Play, our goal is to empower parents by giving them practical information and better tools for making decisions. Our new family star badges convey the specific age range that an app, movie or book was designed for. 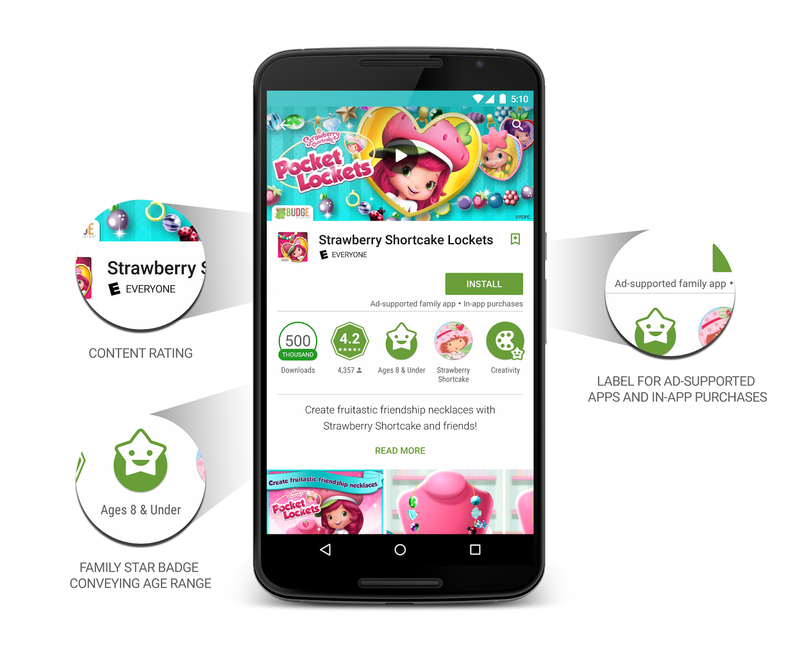 On our app detail pages, you’ll now find a new label telling you when family apps are ad-supported and new locally relevant content maturity ratings. Finally, Google Play has updated parental controls, so you can restrict downloads, purchases or streaming of mature content. We’re rolling out the new family discovery experience over the next couple weeks, and many of the best-known brands in family entertainment are celebrating along with us. Check out our featured collection of new and exclusive content, including Legacy Games’ Crayola DJ, TabTale’s Cutie Patootie, Speakaboos’ Thomas’s Musical Day for Percy, The Jim Henson Company’s Doozers-Play Along Stories, and more — just a tap or two away. As you all know I am always looking for the next big tech gadget and I love Walmart. So imagine how giddy I got when I was browsing press releases and found that the Nextbook Flexx 2-in-1 Windows Tablet is coming to Walmart. It comes with Windows 8 but you can upgrade to Windows 10 when it is available July 29th. You can read the press release below for all the information and see if the Nextbook Flexx is a good value for your family. I think you will love it and it will be a great addition to those summer vacations and road trips! The larger Nextbook Flexx 11 features an 11.6” 1366×768 IPS display, great for reading, browsing the web, emails, playing games and more. With 64GB internal storage, the Flexx 11 is perfect for the entire family to share. The flagship model of the new line, the Flexx 11 features a stylish blue trim and backlit LED keyboard. The Flexx 10 updates the highly popular 10.1” Nextbook and features a 1280×800 IPS display with 32GB internal storage. It is an incredible value with an included one-year subscription to Microsoft Office 365 Personal with 1TB of OneDrive cloud storage for one year and 60 Skype world minutes per month for one year. With a variety of ports and features, the Nextbook Flexx tablets give consumers the flexibility they need. 2-megapixel front and back cameras and a microphone capture pictures and videos. MicroSD card slot and Micro USB port extend the tablet’s storage capacity. Detachable keyboard includes two USB 2.0 ports for additional storage or connecting external devices such as a mouse or printer. The new Nextbook Flexx 2-in-1 tablets have everything a user needs to stay entertained, connected, and informed from almost anywhere. Apps and games available from the Windows Store, including Nook for Windows 8. Micro HDMI port allows content to be displayed on a larger TV screen. 3-axis G-sensor for gaming without constraints. The Nextbook Flexx tablets feature smooth performance for apps, games, videos and more. Quad-core Intel® AtomTM Z3735F processor with 2GB of system memory. Bluetooth v4.0 and Wi-Fi 802.11 b/g/n make browsing, streaming, downloading and more quick and easy. 3.7V 9,000mAh Lithium batteries support up to 8 hours of general use. E FUN, a designer and marketer of mobile lifestyle products, entered the North American market in late 2010. Since then, E FUN has grown to be one of the leading tablet brands at retail, achieving top five market share by volume in 2013. Its ongoing product innovation and partnerships set E FUN apart from competitors and provide customers with unique out of the box experiences. Its product offerings include Android and Windows tablets, home automation devices, and wearables. E FUN is headquartered in West Covina, California. For additional information regarding E FUN’s Nextbook tablets, visit www.nextbookusa.com. I love my Huawei Cell Phone and I tell everyone about it. It was not only affordable but has some amazing features. So when I found out that Huawei was bringing the P8 lite Smartphone to the US, I had to check it out! Huawei, a leading global information and communications technology solutions provider, today launched the Huawei P8 lite in the U.S., making it possible for U.S. consumers to have premium design and features at an accessible price. Available for just $249.99 USD, the P8 lite will be available as an unlocked device, giving consumers the option to take their phone to the network* of their choice. The P8 lite isn’t just beautiful– it’s also elegantly functional. The 5-inch HD Corning® Gorilla® Glass 3 display is designed for visual clarity and utmost durability. The 13 megapixel rear camera has built-in low light and autofocus capabilities which, along with the multi-frame noise reduction algorithm, ensure photos are clearer and brighter. P8 lite is available now, through Huawei’s ecommerce site, GetHuawei.com, Amazon.com, BestBuy.com, B&H in-store and online, Fry’s Electronics in-store and online and various dealer networks. P8 lite will also be coming soon to select Best Buy stores. Windows 10 Releasing July 29th. What Does It Mean For You? For Windows 8.1 users the situation may not be all that grim, they can wait awhile before switching. Windows 7 users may have an issue though. Windows may phase out support for Windows 7; much like they did for XP. I am not saying it will happen but it might. So what does this upgrade mean for you and what will the upgrade include? As much as I hate to admit it, Windows 8 missed the mark for a lot of people. I for one love Windows 8 but there are droves out there that hate it. Which is evident whenever I talk about it on my Facebook page. In my personal opinion I think people will love Windows 10 if they give it a shot. The start menu is coming back. Better than ever. Not only will it have the features of 7 but it will include your favorite apps. Cortana, the world’s first truly personal digital assistant helps you get things done. Cortana learns your preferences to provide relevant recommendations, fast access to information, and important reminders. Interaction is natural and easy via talking or typing. And the Cortana experience works not just on your PC, but can notify and help you on your smartphone too. Goodbye Internet Explorer and hello , Microsoft Edge. A all-new browser designed to get things done online in new ways, with built-in commenting on the web – via typing or inking — sharing comments, and a reading view that makes reading web sites much faster and easier. With Cortana integrated, Microsoft Edge offers quick results and content based on your interests and preferences. Fast, streamlined and personal, you can focus on just the content that matters to you and actively engage with the web. Could it be possible that this will give Chrome a run for it’s money? Time will tell. Office on Windows: In addition to the Office 2016 full featured desktop suite, Windows 10 users will be able to experience new universal Windows applications for Word, Excel, and PowerPoint, all available separately. These offer a consistent, touch-first experience across a range of devices to increase you productivity. Designed from the ground up to run on Windows 10, you can easily create and edit Word documents, and deliver PowerPoint presentations while annotating on the fly. With new touch-first controls in Excel you can create or update spreadsheets without a keyboard or mouse. You will also be able to enjoy new versions of OneNote and Outlook, which are included with Windows 10 at no additional cost. Xbox Live and the integrated Xbox App bring new game experiences to Windows 10. Xbox on Windows 10 brings the expansive Xbox Live gaming network to both Windows 10 PCs and tablets. Communicate with your friends on Windows 10 PCs and Xbox One – while playing any PC game. You can capture, edit and share your greatest gaming moments with Game DVR, and play new games with friends across devices. You can play games on your PC, streamed directly from your Xbox One console to your Windows 10 tablets or PCs, within your home. Games developed for DirectX 12 in Windows 10 will see improvements in speed, efficiency and graphics capability. New Photos, Videos, Music, Maps, People, Mail & Calendar apps have updated designs that look and feel familiar from app to app and device to device. You can start something on one device and continue it on another since your content is stored on and synched through OneDrive. Windows Continuum enables today’s best laptops and 2-in-1 devices to elegantly transform from one form factor to the other, enabling smooth transitions of your tablet into a PC, and back. And new Windows phones with Continuum can be connected to a monitor, mouse and physical keyboard to make your phone work like a PC. Windows Hello, greets you by name and with a smile, letting you log in without a password and providing instant, more secure access to your Windows 10 devices. With Windows Hello, biometric authentication is easy with your face, iris, or finger, providing instant recognition. Now we can all feel like FBI agents when we sign in. I don’t know about you, but that sounds so super cool to me! Windows Store, with easy install and uninstall of trusted applications, supported by the broadest range of global payment methods. The Windows 10 upgrade is designed to be compatible with your current Windows device and applications*. We are hard at work to make this upgrade process a great experience. You can reserve your free Windows 10 upgrade now through a simple reservation process. Look for this icon in your system tray at the bottom of your screen, simply click on the icon, and then complete the reservation process. You can find more details on how this works at Windows.com. Cortana– Mainly because she will write an email for me. How cool is that? Especially when I am super busy and really need to get it out quickly. But in all seriousness, as a blogger I need to be productive and it seems like Cortana is going to be the personal assistant I need but can’t afford. Start Menu– I am an app driven person so being able to not only have my files, etc, at my fingertips, but also my apps, makes me pretty giddy. Windows Hello– You can ask anyone that knows me, I hate to have to type my password just to get into my PC. Windows Hello seems like the perfect solution. How cool is it that your device will recognize you? I am totally going to change my name to Agent Bobbie for even a more coolness factor. Microsoft Edge– Watch the video included above to find out about this exciting new browser. I am so stoked! I am not going to snowball and pretend that Windows didn’t lose a lot of trust with users and their Windows 8. It is kind of like Google making people have Google+ to use YouTube. But the difference is, Microsoft is actually listening to their users. With the help of over 4 million developers they went back to the drawing board to develop Windows 10. Windows 10 integrates the best of 7 with the best of 8. But more than that it moves us into a whole new level of technology that will open the doors to even more exciting things. Yes, what we are used to is great and easy to keep. But sometimes new is good to. It enables us to do more, to learn more, and most of all be more productive in ways we didn’t know was possible. I am not much of a TV person. I used to be back in the day but now I am all about streaming. Most of the time I am in front of my computer or tablet watching my shows. My Dad though? He is old school all the way. He loves Westerns and watches them in the evening on his TV. Especially anything with John Wayne, Clint Eastwood, and occasionally an action flick starring everybody’s hero, Chuck Norris. Last year I finally got him to switch over to a flat screen HD TV. Yes, I pretty much dragged him kicking and screaming out of the stone age. He loves his TV and will now tell you that he couldn’t live without it. But you know what would really, really make him happy, even though he doesn’t know it yet? A 4K Ultra HD TV. Of course I know I couldn’t talk him into it alone. Oh no, my Dad would take some serious convincing. Which is why I would definitely have to take him to a 4K Ultra HD in store event at Best Buy. They are showing off all the major brands including Samsung, LG, Vizio, and Sony. The events are happening May 23rd-September 26th. My dad will be able to not only experience the mind-blowing picture quality, color more real than real and amazing 4K resolution, but will be able to talk to someone very knowledgable. My Dad loves me and trusts me, but seriously he is going to need an expert to change his mind! While he is there he will be able to enter to win a 4K Ultra HD TV and maybe earn a $25.00 gift card for coming out to the event! To find an event near you visit Best Buy for details and locations.